MSNBC’s “Lean Forward” re-branding campaign will be the biggest in network history, and it kicked off last week with the first two Spike Lee-directed ads. TVNewser reports six MSNBC personalities will be featured in individual ads out soon, and five can be viewed online. 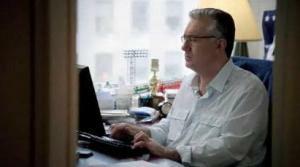 Keith Olbermann‘s has the least voiceover – it centers around the Countdown host sitting at his computer, writing a Special Comment. We see him type, edit, and eventually see a clip of the finished product on-air. Rachel Maddow is shown preparing for her show before, during and after a staff meeting. Joe Scarborough‘s ad gives a glimpse at Morning Joe during the commercial breaks, with the tagline, “Even when the cameras are off, America is always on.” We see Chris Matthews in the 30-seconds before his show goes live. Ed Schultz (yes, Ed gets an ad) walks through New York City to his studio and asks if “reason” is dead. “Hell no,” he says. Lawrence O’Donnell also will have an ad. The ads may not feel like Spike Lee specifically, but they are well-made and unique in the cable news promo department. The music adds to a grander feeling of all the commercials – a packed 30 seconds of interesting camera shots and peel-back-the-curtain moments. Right now, msnbc.com’s “Lean Forward” page doesn’t seem to have the videos available, but if you watch to the end of any video you can choose a different selection to watch.